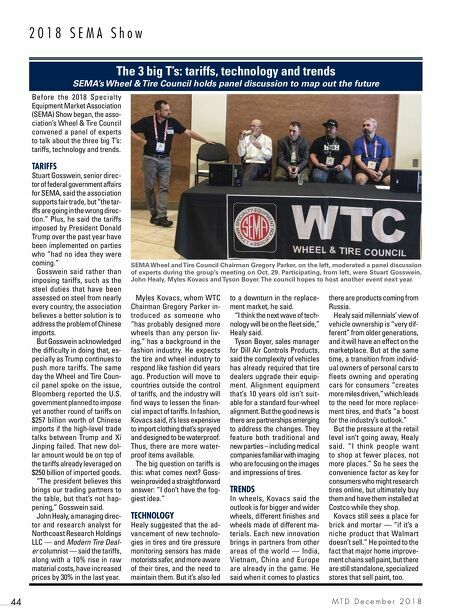 M T D D e c e m b e r 2 0 1 8 44 2 0 1 8 S E M A S h o w Before the 2018 Specialty Equipment Market Association (SEMA) Show began, the asso- ciation's Wheel & Tire Council convened a panel of experts to talk about the three big T's: tariffs, technology and trends. TARIFFS Stuart Gosswein, senior direc- tor of federal government affairs for SEMA, said the association supports fair trade, but "the tar- iffs are going in the wrong direc- tion." Plus, he said the tariffs imposed by President Donald Trump over the past year have been implemented on parties who "had no idea they were coming." Gosswein said rather than imposing tariffs, such as the steel duties that have been assessed on steel from nearly every country, the association believes a better solution is to address the problem of Chinese imports. But Gosswein acknowledged the difficulty in doing that, es- pecially as Trump continues to push more tariffs. The same day the Wheel and Tire Coun- cil panel spoke on the issue, Bloomberg reported the U.S. government planned to impose yet another round of tariffs on $257 billion worth of Chinese imports if the high-level trade talks between Trump and Xi Jinping failed. That new dol- lar amount would be on top of the tariffs already leveraged on $250 billion of imported goods. "The president believes this brings our trading partners to the table, but that's not hap- pening," Gosswein said. John Healy, a managing direc- tor and research analyst for Northcoast Research Holdings LLC — and Modern Tire Deal- er columnist — said the tariffs, along with a 10% rise in raw material costs, have increased prices by 30% in the last year. Myles Kovacs, whom WTC Chairman Gregory Parker in- troduced as someone who "has probably designed more wheels than any person liv- ing," has a background in the fashion industry. He expects the tire and wheel industry to respond like fashion did years ago. Production will move to countries outside the control of tariffs, and the industry will find ways to lessen the finan- cial impact of tariffs. In fashion, Kovacs said, it's less expensive to import clothing that's sprayed and designed to be waterproof. Thus, there are more water- proof items available. The big question on tariffs is this: what comes next? Goss- wein provided a straightforward answer: "I don't have the fog- giest idea." 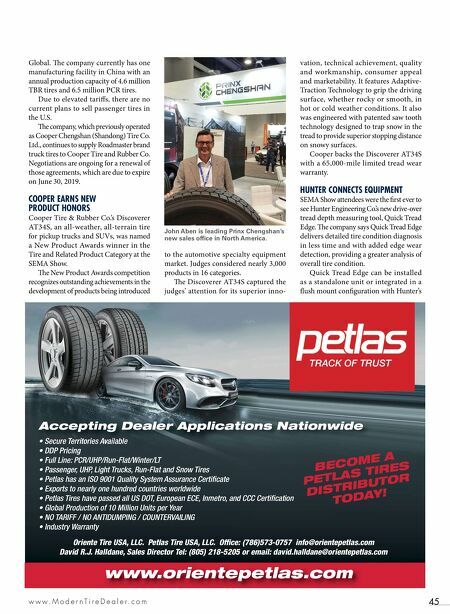 TECHNOLOGY Healy suggested that the ad- vancement of new technolo- gies in tires and tire pressure monitoring sensors has made motorists safer, and more aware of their tires, and the need to maintain them. But it's also led to a downturn in the replace- ment market, he said. "I think the next wave of tech- nology will be on the fleet side," Healy said. Tyson Boyer, sales manager for Dill Air Controls Products, said the complexity of vehicles has already required that tire dealers upgrade their equip- ment. Alignment equipment that's 10 years old isn't suit- able for a standard four-wheel alignment. But the good news is there are partnerships emerging to address the changes. They feature both traditional and new parties – including medical companies familiar with imaging who are focusing on the images and impressions of tires. TRENDS In wheels, Kovacs said the outlook is for bigger and wider wheels, different finishes and wheels made of different ma- terials. Each new innovation brings in partners from other areas of the world — India, Vietnam, China and Europe are already in the game. He said when it comes to plastics there are products coming from Russia. Healy said millennials' view of vehicle ownership is "very dif- ferent" from older generations, and it will have an effect on the marketplace. But at the same time, a transition from individ- ual owners of personal cars to fleets owning and operating cars for consumers "creates more miles driven," which leads to the need for more replace- ment tires, and that's "a boost for the industry's outlook." But the pressure at the retail level isn't going away, Healy said. "I think people want to shop at fewer places, not more places." So he sees the convenience factor as key for consumers who might research tires online, but ultimately buy them and have them installed at Costco while they shop. Kovacs still sees a place for brick and mortar — "if it's a niche product that Walmart doesn't sell." He pointed to the fact that major home improve- ment chains sell paint, but there are still standalone, specialized stores that sell paint, too. The 3 big T's: tariffs, technology and trends SEMA's Wheel & Tire Council holds panel discussion to map out the future SEMA Wheel and Tire Council Chairman Gregory Parker, on the left, moderated a panel discussion of experts during the group's meeting on Oct. 29. Participating, from left, were Stuart Gosswein, John Healy, Myles Kovacs and Tyson Boyer. The council hopes to host another event next year.